Over the years of organized sports, there have been so many legendary two-sport athletes. From Jim Brown to Hines Ward to Jackie Robinson to Lolo Jones to Marion Jones (no relation), we've got ourselves some pretty sweet pickings if we're going to talk two-sport legends. However, I want to hit some low-hanging fruit (and also do a WIRTB to kill a flock of seagulls with one boulder) and talk the careers of Bo Jackson, Deion Sanders...and Michael Jordan's endeavor into (somewhat) being a two-sporter. For many of us, this is the quintessential two-sporter. A behemoth of a man who could bowl through defenders just as swiftly as he could knock a grand slam out the park. He was scary good and made people want to believe in his efforts. A Heisman and several MVP awards while he was at Auburn can do that to people, especially with the numbers he put up in both baseball and football. When Jackson began his two-sport career, people--especially the NFL team who drafted him, the Tampa Bay Buccaneers--had their doubts. I mean, playing two sports has been done before. But, as the eras were transitioning and hits were becoming harder in football (and people were...uhh...partaking in illegal medications a lot more in both sports; just being honest, since steroids and other PEDs can be pretty dangerous), injury concerns and the like made it a bit less likely for someone to succeed at doing the whole two-sport thing. Because of Bo's unwillingness to give baseball up, the Bucs forfeited their pick in the 1986 Draft right before the 1987 Draft. In 1987, after playing Double-A ball for the Kansas City Royals in 1986 and completing his first of four 20 HR seasons, the Los Angeles Raiders, because Al Davis, took a risk on Jackson. In fact, they drafted a contract that allowed for his two-fers and still paid him like a full-time, A-level halfback. Playing with Marcus Allen, Jackson eventually broke through during a classic matchup against the Seattle Seahawks. Yeah, you know which game I'm talking about (and which play). On one play, Bo Jackson became a legend in the NFL. Like, it didn't even matter what else he did; he just ran 91 yards and was so fast, he Forrest Gumped through the locker room. To top it all off, he drags Brian Bosworth, brash Seahawks linebacker, with him into the endzone on another play. So, in his first major game of the season, Jackson ended up with 221 yards, two rushing TDs and one receiving TD. That yard record stood for ten years (but is still a MNF record). That one game resulted in over a third of Jackson's numbers during his rookie season. Now, of course, we know what happened over the years. While he continued to put up some great numbers on the diamond (and amazing plays like the ones seen above), the injury bug bit Jackson on the football field and hard. On a freak accident the same year which saw Jackson put up his second-best career numbers (his 1989 campaign was nothing short of legendary), Bo knew his NFL career was over. However, in those few abbreviated seasons in the NFL, he proved that he could handle the stress of playing baseball in the spring and football in the fall. So, with his football career over, what does Jackson do? He dedicates himself exclusively to baseball, playing in parts of the next four seasons, regaining some of the pop and "scary factor" he had earlier in his career. However, the 1994-1995 strike led to Jackson hanging up all his cleats for good. Leaving the sports world behind at 32, Jackson still displayed the sort of amazing skill that keeps folks talking about him today. Next, let's talk Deion Sanders, a man who was the inverse of Bo. 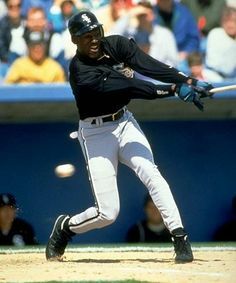 Whereas Bo was more of a crazy power guy, Deion's MLB career saw him as more of a speedy "ace in the hole" who, while he didn't play every game (or every season, as he missed the 1996, 1998, 1999, and 2000 seasons because of football), still made his impact known. Between 1992 and 1995, Prime Time amassed 108 steals over 369 games. In 1997, the first year back from football, he stole 56 bases (which was good enough for second in the National League). So, again, like Bo, his presence was felt. 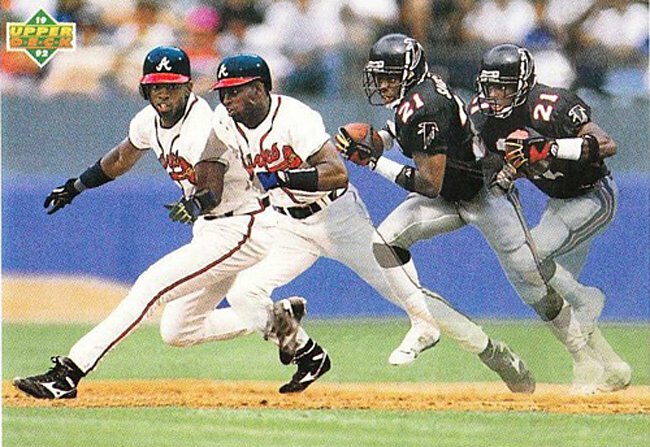 However, as we know, Deion Sanders' biggest contributions were felt on the gridiron. Over his 14-year NFL career, where he saw stops in Atlanta, Washington, Baltimore, San Fran, and Dallas, the Florida State graduate racked up 53 interceptions (five of those came after Sanders returned to the NFL after a four-year broadcasting break), nine INT-to-TDs, nine kick/punt return TDs, and even some receiving touchdowns. And those are just his regular season numbers. What people tend to remember Deion for more than his athletic attributes and contributions is his showmanship. In an era of football that saw a lot of colorful characters, the durug-wearing Sanders still made his own mark. One of my favorite plays from Sanders is his interception of poor Jeff George in the Falcons/49ers game in 1994. After getting into a slapboxing match with Andre Rison, Sanders felt the need to retaliate the best way he could. So, later in the game, Deion Sanders intercepts Jeff George and runs the ball back 93 yards for a touchdown. Typical INT-to-TD, right? Wrong. Deion, while running the ball back, gives the deathstare to the entire Falcons sideline the entire 93 yards. Bo spoke through running through everyone. Deion spoke by having glue-soaked gloves and a personality that you'd either love (if he were on your team) or hate (if he just picked you off and showboated/laughed about it). Thankfully, even though he was pushing 40, I got the chance to see him play with my favorite team, the Ravens, versus against him. 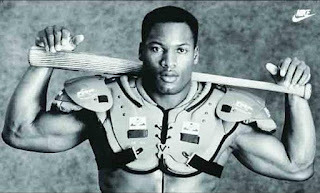 A player who tended to avoid many serious injuries, unlike the cruel, cruel fate of Bo Jackson, Sanders got goaded back into cleats and pads by the likes of Ray Lewis. Now, note. These Ravens teams were...decent-to-meh. They weren't winning any Super Bowls anytime soon. But, seeing Prime Time out there, it was fun. It made it bearable to have to watch Kyle Boller play. All in all, like Jackson, Deion Sanders earned his legendary two-sporter status. But...let's just talk Michael Jordan's baseball "career" and ask ourselves that classic question. Was it really that bad? For one, Jordan's career was a favor from Bulls and White Sox owner Jerry Reinsdorf. Ok, not really. But, it sure as heck felt like it (especially considering Reinsdorf honored Jordan's basketball contract while he was whiffing at fastballs). However, what really happened to bring on Jordan's Homer Dreams was, obviously, a tragedy. Michael Jordan decided to pursue a baseball career to honor the memory of his father, James, who was murdered in July 1993 (this also led to his first retirement). So, in early 1994, he signed with the White Sox and embarked on pursuing an MLB career. Assigned to the White Sox's minor league system, things seemed to be going well. At least he was assigned to a team and not waived like other celebrities attempting to make a sports team (hi Master P). And then, he actually started playing. Now, was Jordan the baseballer really that bad? Eh...when it happened, I was a kid, I was used to Jordan balling and baseball players being better than him. I thought he sucked. However, twenty-plus years later? I'm not so sure. Let's consider he was a man who hadn't played baseball since he was at Laney High. Let's consider that, while he's one of the greatest athletes who ever lived, Jordan was out of his element. Let's consider that the '90s were full of some pretty legit players, even in the minors. Finally, let's consider that he was a 31-year-old man who was, per Baseball-Reference, about seven years older than the rest of his teammates. ...but then, let's consider his numbers. He had 11 errors as an outfielder. He batter .202 over the course of an entire minor league season. His slugging percentage was putrid. He did manage to his three home runs, but amassed 114 strikeouts. So, considering he was a 31-year-old man who hadn't played organized baseball in, probably, over 13 years, he wasn't that bad. But, considering his legacy, his conditioning, and the overall ineptitude of his career as an outfielder? I've got to, ever so slightly, side on the side of "IWTB." Again, Jordan was an older man who, at the least, managed to stand his ground with the rest of his team. However, numbers don't lie (unless they're altered...but these are legit). And these numbers say "MJ stunk at baseball." But, at least he tried. He didn't besmirch his father's name by trying to do this (RIP James Jordan, by the way). So, there you have it, sports fans. A look back at three of the most-memorable two-sport athletes of our generation. If you disagree with my assertions, feel free to hit me up on Twitter. It's only opinion. Fact-based opinion, but opinion nonetheless.